Veteran musician Syl Dopson, 92, succumbed to pneumonia on Monday night. His son Wayne, known in calypso circles as Doppy, said his father developed pneumonia around Christmas and died at St Clair Medical Centre. Wayne, the third of Dopson’s children, is now the eldest surviving child, as his two older siblings have died. 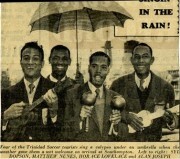 Dopson subsequently formed his own band, Kaiso All Stars, during the ’60s. “The band remained active until about ten years ago, when all its members died, leaving only Syl,” said Wayne. Kaiso All Stars recorded two albums during the ’70s named Kaiso 1 and Kaiso 2, comprising mainly vintage calypsoes. For many years, it was the resident band for extempo calypso competitions. Veteran media practitioner and a friend of Dopson, Mervyn Telfer, said: “Syl was very easygoing but didn’t tolerate nonsense. He was a dedicated family man and was a serious perfectionist about his music. “He was an expert cuatrista and clarinetist and was outstanding as a musician of calypso and parang. He was one of the key musicians who provided music for a television show I hosted back in 1963, named The Lime, on TTT. He played the first time parang music was aired on any electronic media in this country. “When we restarted the extempore competition, with the late Amin Mohammed as NCC chairman, Syl and the Kaiso All Stars provided music for the first three years of the competition, which was a part of Viey la Cou, staged at Queen’s Hall.” One of Dopson’s quirks was that he very rarely played his specially made purpleheart and mahogany cuatro, using instead a Venezuelan cuatro to play in public, keeping his special instrument safely at home. Dopson is survived by his wife, Ophelia, 90, two daughters and Wayne. Funeral arrangements will be published this week.